I should like to put my mission statement on top of a picture that I am inserting using the picture widget but I don't know how to do it. Advice please? Open the picture on your local computer, open any simple image editing program like paint, or photoshop if you have it. Then, select the text tool, write some text ontop of the image, save it, upload it to yola, and you're done! Thanks - I should have guessed it was that easy. I confess I am struggling with quite a lot of things in Yola - I have no html or CSS or photoshop experience - but the pics thing is a really mind bender for me. I want to change my background image, but cant work out a definitive size and also, in the purchasable stock photos, how do you know which is the suitable one for to use fo the Yola picture frames? Also, is it possible to put a picture in the page header? How to add my logo to the banner area? You can see a full list of our tutorials here. debbym, did Francois's suggestions help? I have replied via email but I still need answers to a couple of questions and then I will go away I promise. I have been trying to build a decent website now for nearly a month and didn't expect to have to learn html and CSS when I orignally signed up for Yola, but I have now so I suppose that is not a bad thing. I have watched every Yola tv and I have read every tutorial as far as I can see and I still am not finding the answers to these questions so if you could help I would appreciate it. If I use stock photography what are the sizes I should choose: I can work out the banner size from the existing banner but I am not sure what is the optimum for a small picture. Also what size should one get for a background? It is difficult to choose from the stock photography and I don't want to make expensive mistakes. Can I insert a picuture in a heading? When you are building websites, learning HTML and CSS is not a bad thing :) It is like learning a new language - one that helps you to understand your sites layout and formatting much easier. We appreciate that you have taken the time to view Yola tv and read the tutorials, but I think you are correct in saying we do not yet have one that answers the questions you have asked here. If you are choosing stock photography for your site and want a small picture, the "small" size will be suitable. These usually require only 1-5 credits, but are large enough for websites. 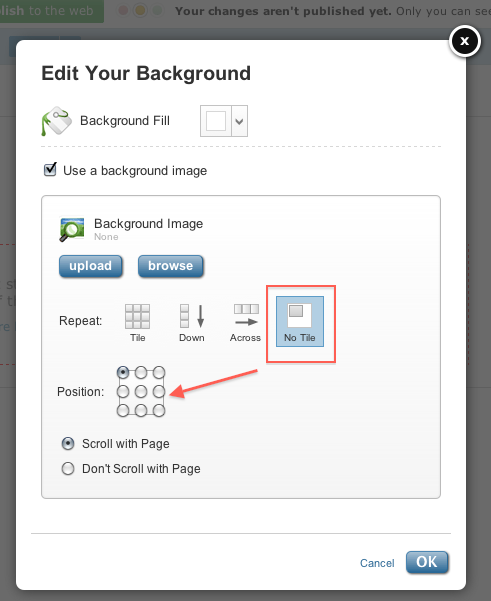 In fact, you might find that you need to reduce the size or crop the image once you add it to your site. Background images are a bit different because there is more than one way in which to use them on websites. 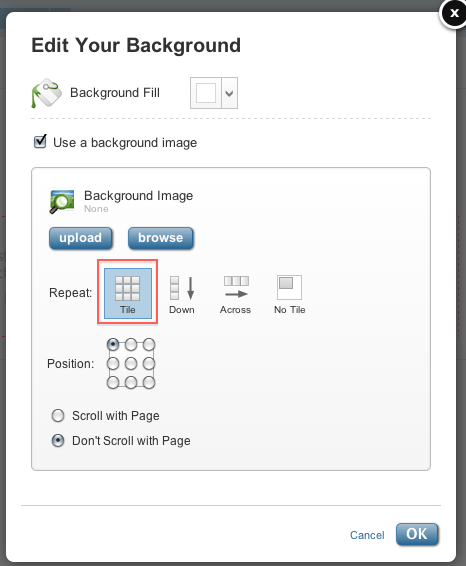 For example, you can add one large background image or you could use a smaller picture and tile in so that it repeats on the background. Of course, this will depend on the picture you choose and the end result you have in mind for your site. Example 1: You want one picture that does not take over the whole page. If you choose a picture that is situated on a particular part of the webpage such as the top left-hand corner, you can choose a small picture size and select where to position the picture when you add it to your site. See the screen shot below of how to do this in Yola. If you choose a picture to use as a backdrop of your whole page, you will need to use a medium or large picture size because it will need to fill a large space. I hope this answers your questions. Let us know if you have any more questions or need more help. Thanks so much Nazlie. That helps enormously. I have learnt an awful lot over this last few weeks and I think I am getting frustrated because I am an advanced user of PowerPoint, Publisher etc and this program is just not doing what I expect it to. Anyway, I am getting there and when it is done it will be a thing of beauty! Wishing you all the best on building your site. I'm sure it will be awesome!